Time was when a king got angry with one of his subjects and said, 'Off with his head' and it was done. Not just that. He would also order the chopped off head to be hung on the walls of the fort. At the gates. The intent was not merely to punish the guilty, whatever be the guilt, but also to prove to the people that the king was all powerful and the same fate would befall them if they ever dared to go against the king or violate the established practice. The question whether it was humane or not, or just or unjust would never arise. The king’s word was law. Since then lots and lots of water has flown down all the rivers of the world and it has witnessed remarkable shifts and twists in history. One significant development is the democratization of a majority of nations and the word of the king is no more the law everywhere. Along with this, human life has also gained some recognition and it can not be ended just because one autocrat thinks a particular individual does not deserve to live. Besides, the world has also seen many wars which have only resulted in loss of life along with destruction of property. Especially, the two world wars and several ethnic conflicts in different parts of the world have resulted in premature cessation of human life. This has made nations think in terms of protecting human life at least from individual whims and idiosyncrasies. Consequently several countries have abolished death penalty as a means of punishing their citizens. This is a minor attempt at humanizing and civilizing society. The efforts of civil societies and human rights organizations of various countries have succeeded in getting 96 countries so far to decide to abolish capital punishment or legal execution as it could be called. In some countries, India is one of them, it is announced only in ‘the rarest of the rare cases’. But what are the norms set to decide which is rare and which ‘the rarest’? More often than not, it is the presiding judge who has to decide the merits of the case in the absence of definite guidelines. That means, in the ultimate analysis, the question of life or death of a person depends on the discretion of one individual which could be very subjective and arbitrary at times. An estimate says that 60% of the world’s population lives in the four countries which still have capital punishment in their law books. – India and Indonesia where it is resorted to only in the rarest of the rare cases and China and America where it is a very common phenomenon. These four countries voted against a U N General Assembly resolution in 2007 calling on the member-nations to, at least, announce a moratorium on capital punishment which could pave way, eventually, to abolition. Amnesty International, the reputed internal human rights organization has come out with very useful information on the issue. Presently, heated discussions are happening in India especially against the backdrop of the implementation of the death penalty already awarded to Afzal Guru,Kasab and several others. Those proclaiming the efficacy of the punishment want these people to be hanged soon and those who are opposed to death penalty want it to be converted to life imprisonment. It should be remembered that besides these there are several others including those accused of killing Rajiv Gandhi and a few tribal activists who have been sentenced to death. The supporters of capital punishment as a legal way of doing justice argue that that is the most suitable punishment for those indulging in such heinous crimes as murder. This, they say, would also make the near and dear ones of the victims of the murder feel ‘satisfied’, feel that justice has been done. More over, they also assert that once such punishment is given out in a few cases, that would be a deterrent to others who might be planning to commit such crimes. Also, the state has to prove that it is powerful and strong and one way of doing it is using the powers bestowed on it by the law of the land. As a consequence of this mode of thinking that at the moment the government of India is being dubbed as weak since it has failed to carry out the executions already ordered by the courts. The Supreme Court of India has decreed that capital punishment could be awarded in cases like murder, murder with the intent of looting, sedition by citizens or members of the armed forces, ‘terrorist’ related crimes, police ‘encounters’, honor killings and others, But even then this sentence could be pronounced only in the rarest of the rare cases, as the highest seat of justice says. The last instance of hanging was in 2004 when Dhananjay Chatterjee of West Bengal was hanged and since then in quite a few cases death sentence has been awarded but not implemented yet and one important reason is that mercy - petitions are still pending with the President of India or the government of India. Obviously it is bound to take some more time before the actual implementation of the verdict even if all the petitions for mercy are rejected. However, there is increasing pressure on governments in many parts of the world for the cessation of capital punishment and India has also been witnessing this phenomenon. Several human rights organizations have taken the lead in arguing for the abolition of capital punishment. The effort has now grown into a movement. Killing a person, even legally, is negation of life, they say. On many occasions, people who had been convicted and sentenced to imprisonment had been found to be not guilty. If these people had been hanged or electrocuted, it would have turned out that they would have been ‘murdered ‘by the system which is meant to protect its members, to do justice. Then there are others who argue for abolition on religious grounds. But no religion of importance has taken a clear position on the abolition of death penalty. Even in countries where they profess Buddhism the legal framework has the provision for killing the accused if found guilty of serious crimes. One very important question arises here: how does the state which normally acts against the interests of the common people acquire power over the lives of its citizens? For instance, the era of globalization, at least in India, has seen the government following a policy inimical to the interests of farmers which has resulted in suicides by a large number of farmers in many parts of the country. This is in spite of the government claiming that the country has achieved remarkable growth rate that a considerable section of the people has also been benefited. Compare this with a suicide due to coercion by some in which the abettor is punished. But in the case of these suicides who is to be held responsible for these deaths which are nothing short of murders? Who is to be punished and what should be the punishment? Unfortunately these questions remain unanswered. The argument that capital punishment can act as a deterrent is a myth. If that were to be true, in countries like China and a few states of the US, by now crime rate should have gone down considerably.. On the contrary, it is reported that crimes in those states of the US, for example, where death penalty is part of the legal system are more compared to the states which have removed this provision from their law-books. Then there is the argument that by punishing the murderer with death the close relatives and friends of the victim could be made to feel ‘satisfied’. Is it not position that adds to the revengeful attitude already present in us? Can a society claiming to be civilized afford to do it? In some countries where Islam is the official religion and Shari at is followed, the culprit can get relief if the members of the family of the victim decide to spare the life of the culprit: but then it depends on the will of the some individuals and there is no legal compulsion. 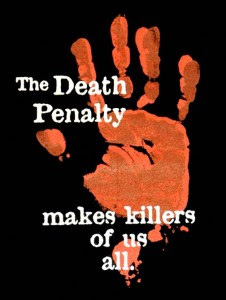 All the arguments cited above in favor of legal execution try to establish that capital punishment is the only way to prevent further crimes and understandably the general perception in the society is also for capital punishment, at least in our country. It is so because there has been no serious effort at building public opinion through concerted campaign and whatever little is being done by human rights organizations here and there has been met with very little success or cynicism. Killing, even legally, by the system as a way of punishing offenders only smacks of the tyranny of the system and its unbridled power over the lives of its subjects. That is for the autocrats and an uncivilized one at that. So much so, the European Union has stipulated that any country wishing to be a member of the organization has to first take out capital punishment from its justice - system. This is certainly a slow but sure way of moving towards civilized living. We claim very often that ours is an ancient country espousing human values and that the whole world, especially the western world, looks to us for answers when ever they are beset with problems . This much acclaimed’ spiritual superiority’ of India can best be established not just through claims made in internal and international forums but by translating into practice some of the suggestions being made by the civil society and abolition of capital punishment is one such important proposal. Here in , we have to admit that some countries have moved ahead of us and shown themselves in better light. It is not merely the government that has to decide in favor of abolition of death penalty, but it has to be part of the social consciousness. The Constitution of India stipulates that “no person shall be deprived of his life or personal liberty except according to procedure established by law.” (Part III, Article 21 of Indian Constitution). That needs to be amended so as to remove the provision to deprive a person of his or her life even “according to procedure established by law”. To do that a strong public opinion in favor of abolishing legal execution has to be created and eventually the society or at least the right thinking people should bring pressure on the government to put an end to this provision. What is needed now is that one has to put aside all false emotions and subjective considerations and be prepared to apply one’s mind to this intensely human problem. Can one hope to see that day soon?